When confronted by our worst nightmares, the choices are few: fight, or flight. We hope to find the strength to stand against our fears but sometimes, despite ourselves, we run. What if the nightmare gives chase? Where can we hide then? Matt and Nathan try to find answers. Hiro continues his journey with Kensei. Monica and Micah explore her new-found ability. Mohinder looks to help Molly, while dealing with other evolved humans. A mysterious woman seeks out a hero at any cost. Matt discovers a new trick. At Mohinder's apartment, Matt and Mohinder watch over Molly. Matt insists that they bring her to a hospital, but Mohinder tells him that no hospital is capable. Mohinder tells him that Matt has to find his father to bring Molly back, and Matt tells Mohinder that Angela can help. Monica is being interviewed by Officer Landry about the incident that happened the night before. He tells her that the robber is a gang banger and has hit up three other fast food joints. Monica doesn't tell the cop that she can identify him, and he leaves, saying he can't help a neighborhood that won't help itself. Matt goes to ask Angela questions, and Nathan chastises him. Nathan wants to go with Matt to Philadelphia, but Matt thinks otherwise, telling Nathan about what Matt's father did to Molly. Nathan tells Matt that he has to help him, and Matt wonders if they can get there fast since Nathan can fly, but Nathan thinks otherwise. Camille talks to Monica and asks about the other night with her doing "karate kicks." Monica tells her that she has no idea how she did it or why, and that she thinks she learned how by watching TV. She tells Camille that her body does things before her brain knows what's happening. Camille tells her that everything is going to be okay, and Monica heads home. Matt meets up with his dad. Matt and Nathan walk up to the apartment, and Matt tells him that he doesn't know what he's going to do. Matt appears very nervous, and Nathan tells him to get his gun, then knocks on the door since Matt won't. Matt breaks open the door, finding his father armed. His father Maury, wants to know why Matt is there, and Matt asks what he's doing to Molly and what he knows about Kaito's death. After Nathan calls Matt "Parkman", Maury recognizes Matt, and Matt quickly disarms and handcuffs him. When Nathan asks why he's armed, Maury motions to the table where Nathan finds a similar death threat to his mother and Kaito. Maury tells Matt that Molly was looking for him, and that he was trying to protect himself. Maury tells Nathan that he met his folks, Kaito and others a while ago. Nathan tells Matt to read his mind, and his father finds that amazing. When Matt tries to read Maury's mind, he gets a block and his father tells him that it hurts for a reason and reveals that he is also telepathic. Maury tells Matt that their powers only start at reading minds and offers to show them something to explain better. He leads Matt to another room where Matt finds himself locked in a prison. When Nathan bursts into the room, he appears to be on a rooftop in a devastated New York. Maury leaves the apartment; he has used his powers to trap Matt and Nathan inside some of their worst fears. Monica finds Micah playing the piano, and Nana notes that it's wonderful to have a musician in the house again. Monica walks up to Micah explaining that no one has played the piano since her mom died. Micah apologizes for playing, but Monica tells him it's okay and sits next to him. Micah asks if she misses her mom, and he comments that he misses his too. Monica starts playing the piano with Micah, and Micah asks if she can play piano, but she tells him that she never learned. Suddenly, she finds herself playing fast and uncontrollably, then walks away frightened. Mohinder calls Noah on the phone. Mohinder tells Noah about Molly's condition. Noah, who is with the Haitian in Odessa, Ukraine, tells him not to bring her into the Company, but Mohinder tells him that he must help Molly. Ando brings the scrolls from Hiro to Tatsuya Atsumi, who tells Ando they are authentic. Ando tells him that a few scrolls are damaged and he must know what they say. After some work, Tatsuya puts it under a microscope to show the hidden characters. On the scroll, it tells Hiro's tale of helping Kensei. Kensei and Hiro run up to Yaeko with another fragment of the tapestry to find Whitebeard's camp and help find Yaeko's father. Niki tends to get out of control. Monica has cut a few more rose tomatoes, and Micah tells her he thinks he knows what happened with the piano. He goes to the television and puts his hand on it, and it turns on and off, explaining how he rigged the pay-per-view. He tells her he thinks it runs in the family, since D.L. could walk through walls, and his mother is another story altogether. He shows her a 9th Wonders!, and points out St. Joan, the muscle mimic who can do whatever she sees. She shows him the tomatoes, and how she saw it on TV. Micah tells her that maybe they should test it out. At a company facility, Bob tells Mohinder that he made the right choice to bring in Molly. Bob gives Mohinder another assignment to find another person, and hands him a taser. Bob explains that most aren't in control of their abilities, and Niki suddenly bursts in, throwing Mohinder against a wall and then chokes Bob. Mohinder stuns her to stop her choking Bob. At a park, Micah and Monica go to see skateboarders and basketball players, but Monica suggests double-dutching since she was never good at it. Using her ability, she watches a girl jump rope, then jumps in. Elle works on cars too. Ricky sees Elle in the pub. He tells her he's closing, but she asks him about Peter. Ricky insists that he doesn't know Peter, and Elle begins to leave. She asks why all the guys at the docks would say he's at the pub, but Ricky continues to tell her that he doesn't know the Peter she is talking about. She then pretends to leave by walking over to the door, but instead locks it and welds it shut with electrical currents. She then turns around and sends a large blast towards Ricky. Bob watches over Niki, and he tells her multiple personality disorder is difficult, but he'll help her. Mohinder watches over her, and after Bob leaves the room, tries to unshackle her. She tells Mohinder that she came here on her own to get help because no one can help her except the Company. On the rooftop, Nathan hears Peter's voice and sees Peter lying down, covered in ash. He bends down and sees a burned up version of himself instead of Peter. Matt, in a prison, sees a baby crying, then finds Janice holding the baby. Matt and Nathan seem to be fighting each other without realizing it. During the fight, Matt realizes he's fighting Nathan after reading his mind and tries to wake him up. However, Nathan is too caught up in his nightmare and strangles Matt, causing him to be unable to speak. In his desperation to stop Nathan, Matt unexpectedly manages to project into Nathan's mind a message to wake up and they snap out of it. Finding Maury gone, Matt comments that he now understands why Molly calls Maury "the Nightmare Man." Matt is unsure of how he woke the two up and they find a picture of Bob who Matt recognizes as the leader of the Company. Realizing that Bob is Maury's next target, the two go to save him. Ando reads on the scrolls more about Kensei's journey to defeat Whitebeard. Yaeko insists that they follow in battle, and the three see how massive Whitebeard's army is. The story cuts off, and Ando cannot read the rest. Tatsuya tells Ando that it's difficult to make out the rest, and will need time to recover the scrolls. Nathan is having a bad dream. Monica flips through channels, and watches kung fu, replicating Bruce Lee's motions. Micah watches her do flips and kicks. She wonders what it all means, and Micah tells her that they're special. She wonders why God gave them the gifts, and then tells Micah that it's their secret. After Micah leaves the room, Monica then goes to answer a knock on the door and finds Mohinder. He tells her that he has answers to her questions. Peter finishes the painting and asks what happened. He doesn't realize he painted the painting, and Caitlin explains that his eyes went white. The painting displays what appears to be Peter and Caitlin outside of a building. Peter sees the street signs by the building in the picture are in French, and Caitlin wonders if they need to go to Montreal. She receives a phone call and the two rush to the pub. Tuko sits next to Ricky's burned body, and Peter apologizes to Caitlin. He tells her that they came after him, it's his fault, and that he can't hide anymore. "We can probably get there faster, you know, because you can... "
"I'm not a cargo jet, Parkman." "Nathan, wake up! Wake up, wake up, wake up! Nathan, wake up! Wake! Up!" -Matt uses a new trick to end the nightmare. "Now we know why Molly calls him the Nightmare Man." "But you stopped it. How'd you do that?" - Matt and Nathan discuss their nightmare and Matt's new trick. "What's next? I can't read the next words!" "These are still too damaged. I need more time. I'm sorry." "But, I must know what happens next. With the army! With Yaeko! Does Hiro survive?" "All right, I killed him, okay? What is the big deal?!" This is the first episode in which Hayden Panettiere does not make an appearance. 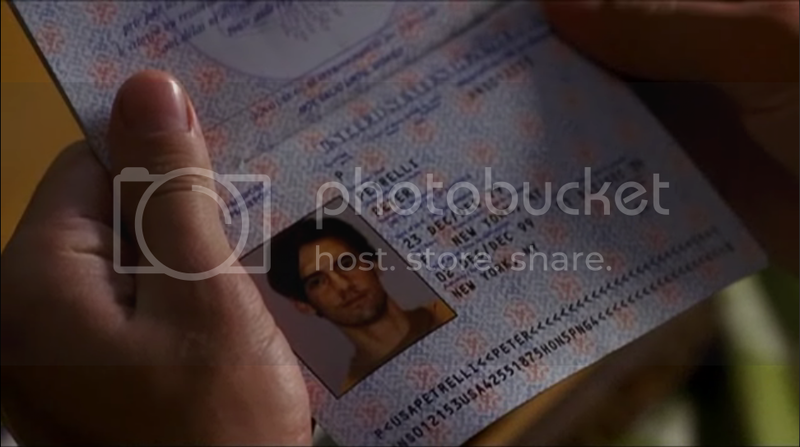 On Peter's passport, it shows one category with the designation as "F". In an interview, Aron Coleite and Joe Pokaski confirmed this was merely a production error. A replacement scene was shot with a corrected passport, but was not used, although Aron and Joe state that it will be corrected for the DVD. However, it is not corrected on the DVD. The song that plays while Monica is rope jumping is "Boys" by M.I.A. When Maury Parkman traps Matt in a nightmarish vision, the prison guard speaks to him in reverse. The scene, according to Aron Coleite and Joe Pokaski, symbolizes Matt facing one of his worst nightmares: his dyslexia. When the sound is reversed, the guard says "You know the drill Parkman, hands against the wall", and then "You abandoned your kid, you a deadbeat, and now you're gonna pay." A video with closed captioning of this scene can be seen at Overcast Media. The term "fight or flight" was coined by American physiologist Walter Cannon in 1915 to describe the actions of the sympathetic nervous system. This episode has the first indications of Matt's powers expanding from just being able to read other people's thoughts: Maury tells him it just starts like that and Matt is able to implant the thought of waking up into Nathan's head to snap them out of the nightmare Maury trapped them in. Matt later develops the abilities to call other people into the visions he's experiencing, implant thoughts into people's heads on purpose (he only did it out of reflex here and was unsure of what he did), make mental illusions and enter other people's minds to free them from comas (at least ones that are caused by other telepaths). During this episode, Mohinder and Matt watch Molly as she sleeps. The thoughts and images that are occurring in her mind while she is asleep can be seen in the graphic novel Molly's Dream. This episode shows an illusion of Matt Parkman, Jr. but the actual character did not appear until Volume 4. In The Art of Deception and The Wall, Matt is able to replicate what his father did to him, Molly and Nathan and trap Sylar in his own nightmare before he's rescued by Peter. For images from Fight or Flight, see images from Fight or Flight. For the transcript from Fight or Flight, see the Fight or Flight transcript. This page was last modified on 5 June 2016, at 02:21.